I ran across a very cool post in the Amiga Facebook group recently by a Swedish Amiga fan named Jan Pedersen. He was asking what folks thought his Amiga A1060 Sidecar was worth. Amiga A1060 Sidecar? Frankly, I don't think many have ever even heard of the A1060 (I've never even seen one in person - just magazines). The Amiga A1060 Sidecar was an expansion made by Commodore Germany (specifically West Germany on the manufacturer label) for the A1000. The A1060 a beast of an expansion that adds a PC to an Amiga 1000 workstation. And it’s totally bizarre. Through the Amiga 1000's power side expansion, the A1060 can be pressed into the side of the machine thus creating a gigantic dual-computer. You can have MS-DOS running with the Boing Ball bouncing in the background. I guess. It’s hard to imagine someone back in the day justifying the presumably high cost of this kind of workstation hybrid rather than just buying a stand-alone PC. While the A1060 offered the perceived top-shelf PC library of productivity software, it did it at a ludicrous premium. Regardless, it’s a pretty wild thing witness if a bit clunky looking. Check out how Jan and a friend of his set up a dual-monitor station (note how the A1060 is actually taller than the Amiga). Clever use of a smaller monitor for the PC side. I'm guessing that back in the day this type of expansion takeover would have meant the Amiga user couldn't easily update his/her RAM. But maybe that could be shared on the PC side? When Brian and I, tested the A1060, and tried to make a 'dual' screen setup many years ago. In the A1060 there was installed a old 9pin EGA card, and a Harddisk controller, the the 5.25 FD drive was made external. Brian made a Amiga boot disk, there started "Janus" and got access to the A1060's harddisk and then it will boot workbench from HD (so we had 2 partitions, MS-DOS and Amiga-DOS). Worked like a dream, and we had a lot of fun.. To swap between monitors you pressed A+m as I remember. I’ve spoken to Jan since that post and it’s worth noting his collection appears to be vast and significant. His knowledge runs deep going all the way back to the earliest of Amiga days. Thanks for sharing your A1060, Jan! Very cool Amiga stuff from 1986. A few years ago, I saw this device (at least similar to the picture posted) together with a A1000 at a retro-computer store ( The Hackery in Vancouver, BC, Canada). I just presumed it was a expansion unit for the A1000. The store owner normally collects a lot of retro computers (also rents them for Movie Filmings in the area). When I was there, my eye was for an Amiga A1200 that just arrived / saved from recycle. Got it as-Is for $50 Cdn. @RizThomas, the last A1060 that sold on Ebay in Canada went for C $1,725. That was Jul 24, 2018. Wow...it goes to show that A1000 is still the best classic. I Wonder if The Hackery (here) still got it... On another note I wonder how much the A1010 external floppy drives cost nowadays...I still have 5 - 6 still in the loft. Pinged you on the post the moment I saw it on facebook. Looks fantastic. But that ebay price for the other one though. Wth?? I thought one sold on ebay a few months ago for not much money. Maybe I misremember. Back in the day when I was learning COBOL and Pascal on old XT's I could have really done with an expansion like that! I used software emulation. It was usable, but slow and clunky. 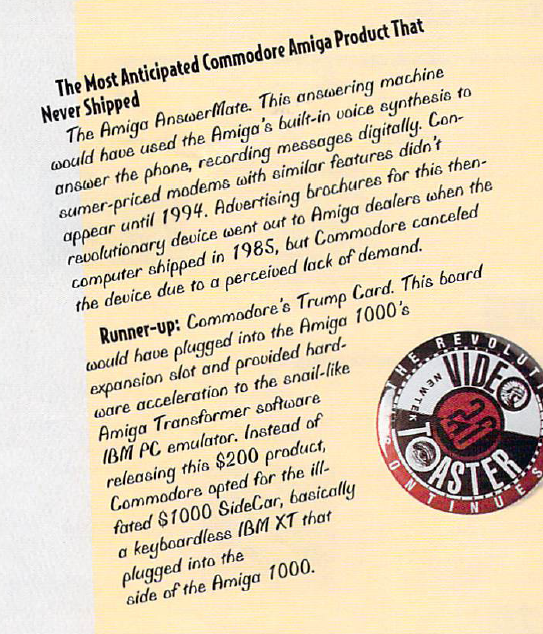 "Amiga Transformer", that was the software! I have absolutely no use for one of these, but it just looks like the cat’s pyjamas sitting there next to the 1000 with the monochrome screen on top. So on that basis I want one!